Can anything remove fingerprints from your fingers? Here's where it gets interesting; I don't mean erase them from an object, I mean from your fingers directly. Some people claim there is a way to do it, some people claim it's impossible. I have a friend (no, really, she exists, I swear) who is attempting to write a novel, and for once, someone turned to a skeptic in an attempt to get the science right. She's been apparently scouring sites like this in an attempt to find a plausible method, presumably because there aren't many places to go for hard facts on this topic. Of course, there's very little (I couldn't find any) scientific study published on this topic, and many proposed solutions to the problem seem to be quite painful, bloody, and ultimately futile. It's also probably safe to assume the people offering advice via message boards on this particular topic are at best speculating, haven't actually had any practical or relevent experience, and are most likely basing claims on exaggerated or fictional accounts rather than demonstrable evidence. (Interestingly, I kept running across stories involving John Dillinger attempting this which may or may not be true). However, without the data, there's obviously no way for me to say for sure. Cut them off - (not your fingers, just your fingerprints) Apparently this does not work that well, is obviously painful and could possibly make fingerprints more distinctive according to some. Using a corrosive substance - Does not seem to yield acceptable results, as much like cutting them off, they will regrow. Burning them off - This has received some questionable support, but many seem to think they will grow back. Rubbing them off - some claim this smooths them out, and is certainly not as gory but they quickly return to normal. Surgical removal - I ran across some unverifiable claims about this method. And at least one strange method involving a pineapple which only attempts to alter them, not remove them entirely. I keep thinking that there's something I'm missing here. Have any of those methods ever been proven to be successful? Has anyone ever successfully had his/her fingerprints erased successfully by any method? Is there a scientifically valid way to do it, even if it's extremely improbable? Or is this all just spy-movie stuff with no hard science behind it? According to Stephen G. Fischer Jr., a spokesman for the FBI's Criminal Justice Information Services, methods of fingerprint mutilation can vary depending on the circumstance and the criminal. "It can go from people chewing on fingers, using a knife, burning acid or cigarettes. Or if you have a career criminal or someone who is a little more affluent, they might go to a surgeon." While no hard data on fingerprint mutilations exist, Fischer says the FBI's forensics examiners have noticed the uptick over the last few years, though the reason is unclear. But advancements in forensics technology have made fingerprint mutilation increasingly difficult to pull off, as even severely damaged fingers will provide investigators with clues. "We can identify prints that we couldn't 10 or 15 years ago. Basically, they're going through all this pain and expense for no reason." A Singaporean cancer patient was detained by U.S. customs because his cancer treatment had made his fingerprints disappear. As it turns out, the drug, capecitabine (brand name, Xeloda) had given him a moderate case of something known as hand–foot syndrome (aka chemotherapy-induced acral erythema). What are some other ways that fingerprints can disappear? people who work with lime [calcium oxide] - because it's really basic and dissolves the top layers of the skin. The fingerprints tend to grow back over time. surprisingly, secretaries - because they deal with paper all day. The constant handling of paper tends to wear down the ridge detail. also, the elasticity of skin decreases with age, so a lot of senior citizens have prints that are difficult to capture. The ridges get thicker; the height between the top of the ridge and the bottom of the furrow gets narrow, so there's less prominence. So if there's any pressure at all [on the scanner], the print just tends to smear. "... your skin replaces at a fairly good rate, so unless you've done permanent damage to the tissue, it will regenerate." One case of DPR is Flight attendant Cheryl Maynard. This is largely anecdotal, but it is certainly possible to temporarily obscure one's fingerprints by simply coating one's fingerprints using glue, or a similar liquid adhesive. I've had this happen to me while working with cyanoacrylate adhesives, more commonly known as superglue. Basically, the adhesive forms a film over the fingertip, and fills the grooves, then cures. The end result is a smooth surface on your fingertip. Some rock climbers use cyanoacrylate to repair damage to the skin on their fingertips. Similarly, stringed-instrument players can form protective finger caps (in addition to calluses) with cyanoacrylates. Thin CA glue also has application in woodworking. It can be used as a fast drying, glossy finish. Which is exactly what happens if you get it on your skin. Fortunately (or unfortunately, depending on why you are trying to obscure your fingertips), getting CA glue on your skin is not permanent. It simply flakes off along with the outer layer of skin, as your epidermis naturally replaces itself. According to a 2012 Cracked article, Robert Phillips succeeded with a skin graft. Phillips simply convinced a doctor to graft skin from his abdomen and surgically sew it where his fingerprints were. Just like that, Phillips went down in history as the only known successful case of someone permanently blanking out their fingerprints. However, that didn't help him. Fingerprints are generally attached to something else that leaves impressions on whatever it touches. That, of course, being a hand. 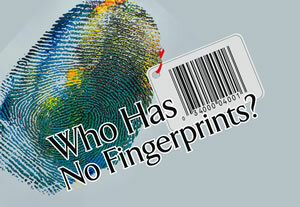 While police found no fingerprint evidence, what they did find were several prominent palm prints with anatomically incorrect blanks where the fingerprints should be. This would end up being vitally important a few weeks later when Phillips was arrested. Shockingly, it seems that a person with no fingerprints sticks out like a non-fingerprinted sore thumb when it comes time to book people into jail. It's not like there are millions of fingerprintless people walking around out there. It was pretty much just Phillips. So his printless fingers were just as damning as a matching set of prints would have been. Here is an article (LANG=DE), talking about the dependency of fingerprints from a single gene, cited in the American Journal of Human Genetics, 2011; DOI: 10.1016/j.ajhg.2011.07.004. They don't talk about manipulation of fingerprints, but of the mutation, they observed in whole families (there are only 4 families known, with multiple people affected from the deviation), which they investigated further, to find out, that a single modification is responsible, to make the fingerprint vanish. (But from the beginning - not modifying a living person or adult). Fingerprints are available after 24 weeks of pregnancy, and don't change significantly later. Whether it will be possible, to provoke this in near future, isn't discussed. Not the answer you're looking for? Browse other questions tagged biology criminology . Does holding your stomach in prevent it from growling? Can you put a gag in someone's mouth to prevent them from talking? Can handcuffs be picked with a single hand while handcuffed? Did Russian scientists manage to remove black skin from a man?